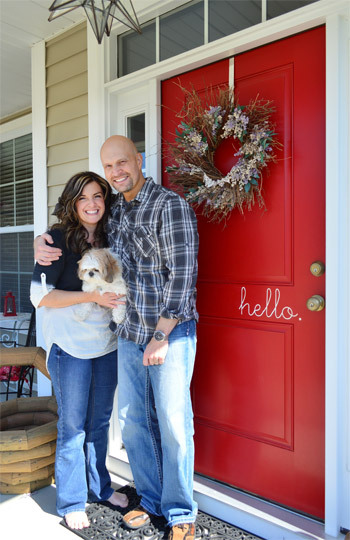 Painting your front door is one of the best ways to add character and curb appeal to your home. Get inspired by these tried and true front door paint colors! 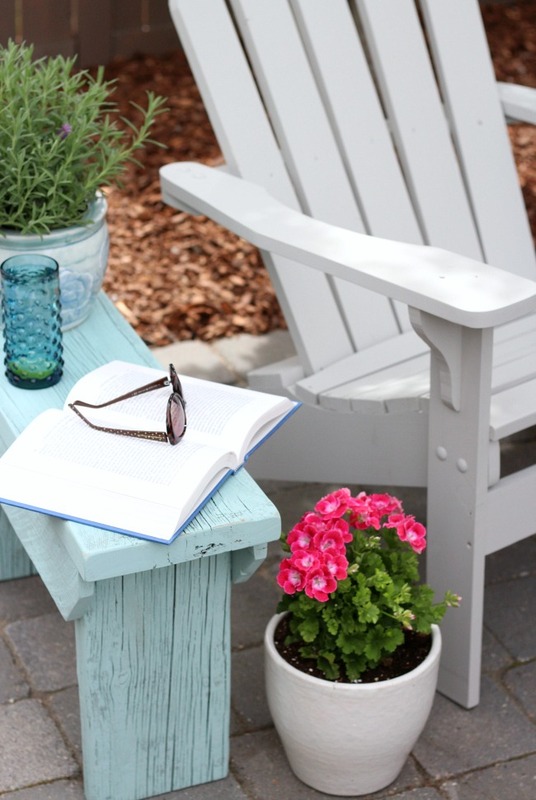 Spring is just around the corner, which means I can’t help but think about outdoor improvement projects. There’s something about getting outside after being cooped up all winter and sprucing our exteriors up, isn’t there? A bit ago, I helped Nicole pick a front door color and offered suggestions for adding more curb appeal to her home. If you’re contemplating a new door color, I suggest heading over to that post as well for a list of important things to consider before making your final paint selection. In my opinion, front door paint colors are highly personal. Sure, the undertone needs to work with the other exterior colors of the home first and foremost, but there are so many different options that will work for one particular home. 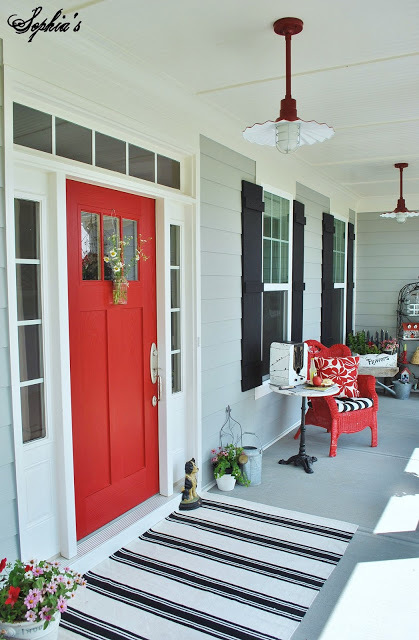 With that being said, I’ve rounded up some beautiful front door inspiration pictures, as well as some specific paint colors (with all the details) to help you narrow down your choice. Enjoy! Please remember to pin these lovely exterior painting ideas from the original source. 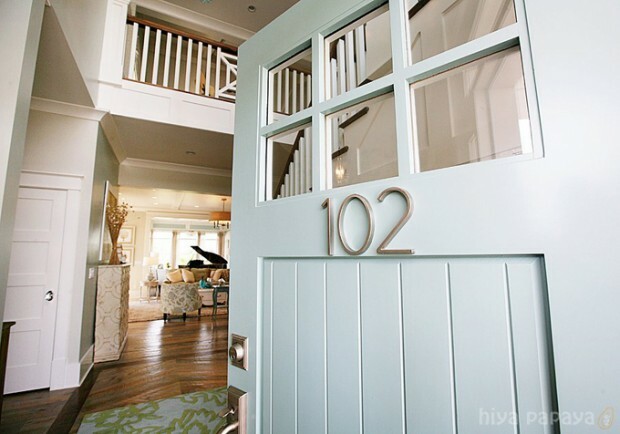 Or for something a little on the brighter turquoise side, this Starry Sky door spotted on HGTV is lovely too! I seem to be drawn to all shades of blue when it comes to front doors. 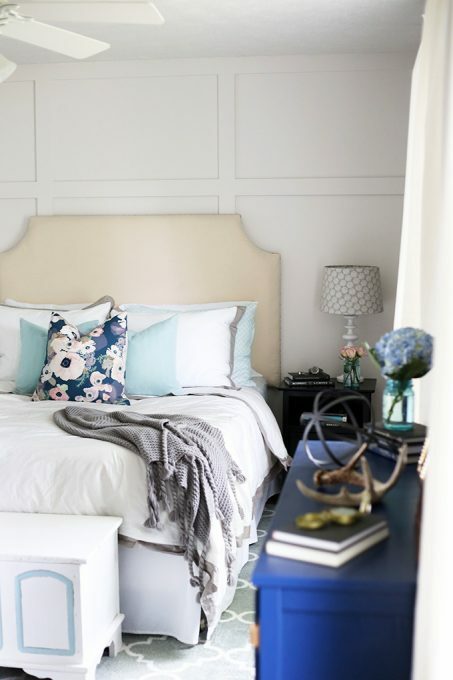 Click here to see some of my favorite blue door paint color picks. If blue really isn’t your thing when it comes to exterior paint, green may be a better option. This soft green front door spotted on Better Homes & Gardens pairs nicely with the white siding and black shutters. I find it to be playful next to the traditional style of the home. For a little more punch, I’d go with a bright green door like this Sassy Green one found on This Old House. Don’t forget about painting the interior of the door too. 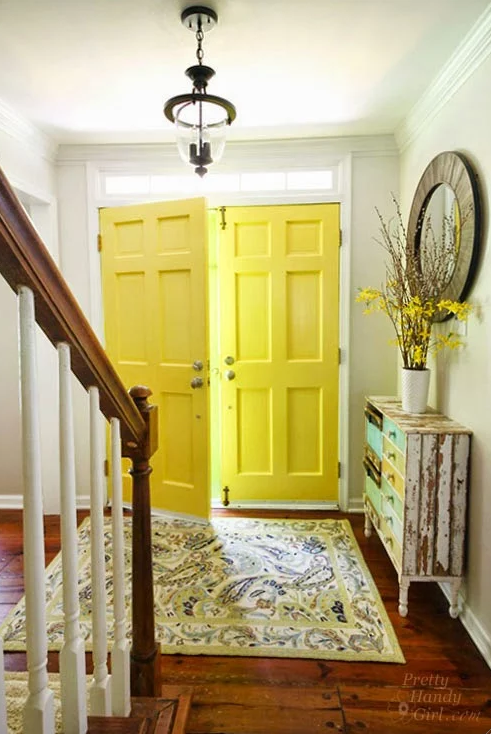 A bright pop like these fabulous yellow doors can waken up your entryway! 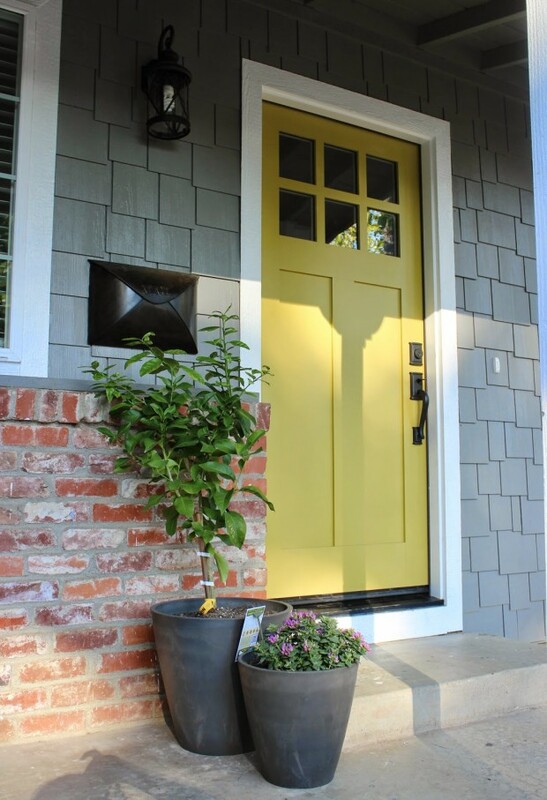 I’m loving the punch of this bright yellow door in addition to this canary yellow dutch door (both spotted on Better Homes & Gardens). Quite the impact with a small amount of paint. For something a little more subdued, this butter yellow door is a nice option. This red dutch door is probably my favorite in the bunch. I just love the style of these split doors. Someday I’ll have my own! Did one particular front door color stand out in the bunch? 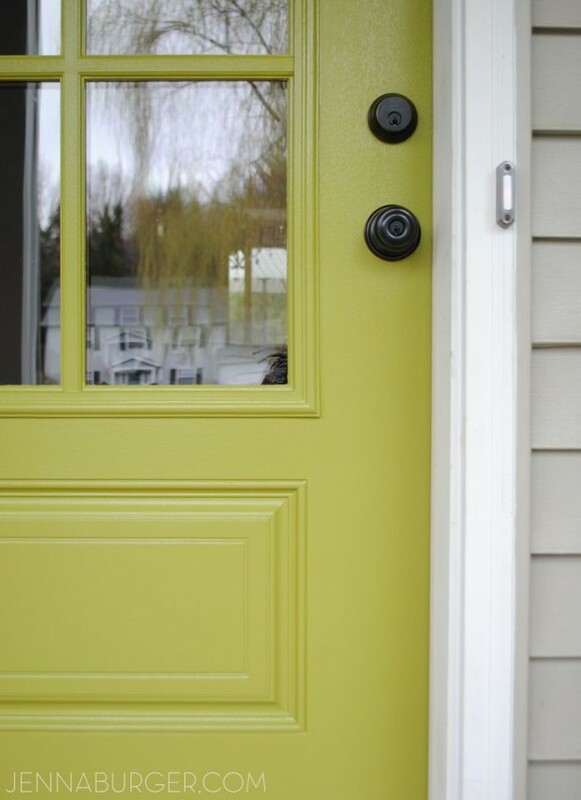 Do you prefer a brightly colored front door or one that’s more subdued? I could easily live with any of these door color picks depending on the setting or style of the house. They’re all well-designed in my opinion. Still asking yourself: What color should I paint my front door? I’ve narrowed down a few of my favorite paint color names and brands that coincide with many of the front door paint color pictures above. 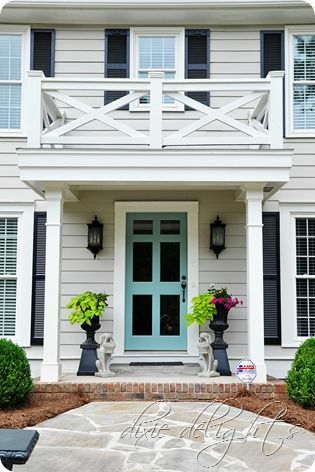 Find front door paint color options from Benjamin Moore and Sherwin Williams. Tell me, what color is your front door painted? Thinking about changing your exterior paint colors? I’m still enjoying ours, but some of these gorgeous options have me thinking. What kind of paint should you use on a front door? 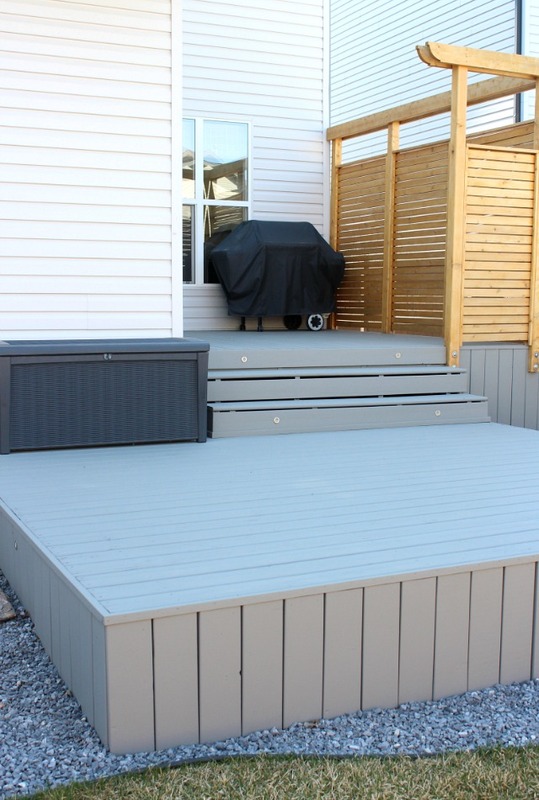 Be sure to use a quality exterior latex paint that stands up to the elements. One that’s a paint and primer combo is ideal. 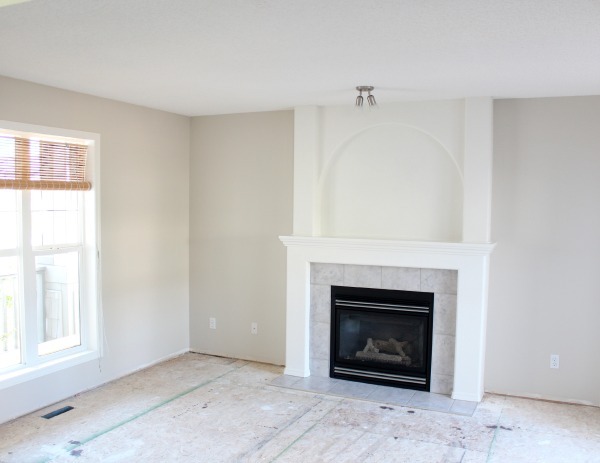 Looking for interior paint color suggestions too? Learn my tips and tricks for selecting the right paint colors. 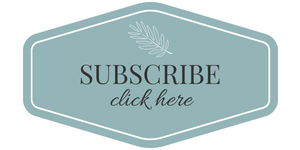 Want more decorating ideas and paint color suggestions like these sent directly to your inbox? I know! That Dutch door is on my list for our next home! Gorgeous colours! It’s time to repaint the exterior of our house, this is great inspiration! Do tell, which door is a dutch door ladies??? Karen, it’s the red one towards the bottom that splits in half. So cool, right? I just love your blog it’s so vibrant !! OOOh, yes the front door dilema. I agree, it’s really personal but I’ve always wanted a red door and that robin’s egg blue is gorg. I have been thinking about painting my front door again too! I’ve got a grey house with white trim and gone from a white door to red to orange and now I think it should be green – we’ll save yellow for next time! Thanks Shauna for your beautiful inspiration! 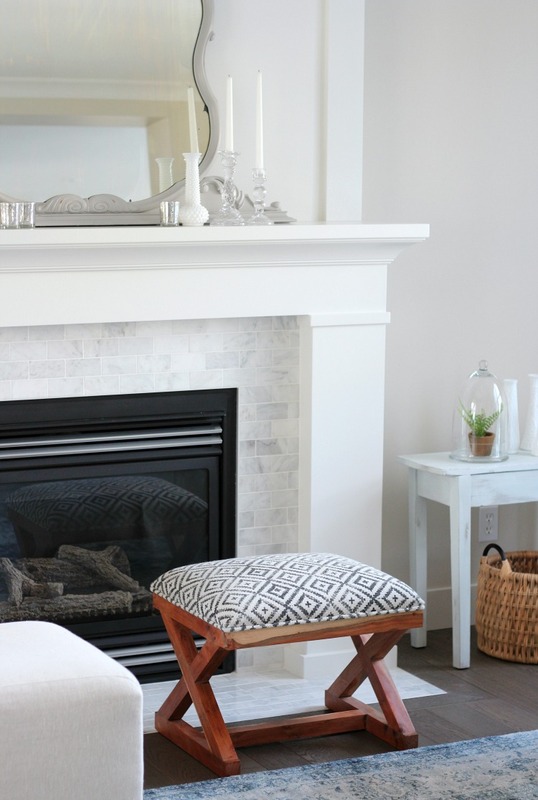 Such an easy change that brings a new feeling to a home, right? I’m really liking the green ones right now too. Love the front door colors. I have a dilemma, I recently had my front door painted Benjamin Moore “stolen kiss”. The accents are black rod iron knobs, with black rod iron mini window speaker, and black door knob. Uncertain, on the color choice for the door jam and trim. Red? black? or white? The lead-off shot caught my eye! I love that one, and the red doors. If I was painting my front door, I would be going in one of these directions!! Nice article and the pictures are very helpful. What would you suggest for a home with khaki siding and white trim/black shutters? I had picked up the BM Caliente at the store about a year ago and laughed when I saw it on the list! I’ve had a red-colored door before, but wasn’t sure about trying any of the other colors this go around. Any help is appreciated! That is my house color combinations too (taupe, white trim black shutters. I have a black door matching the shutters but I want so badly to add color to my door. I’m thinking a burnt orange but all my landscape is pink/purple/yellow. I also like the idea of doing a wine/burgundy color or an aqua. I have a steel front entry door, that has a high gloss white paint on it, can you suggest how to go about painting it another color? Also want to know what color would go with dove grey, with the trim paint being dark charcoal, I’m leaning toward the chartreuse color, what do you think? I would talk to someone at the paint store about the best way to cover gloss. You’ll probably have to prime. Without knowing which way your home faces or other elements (landscaping, etc. ), chartreuse is likely a good color choice. 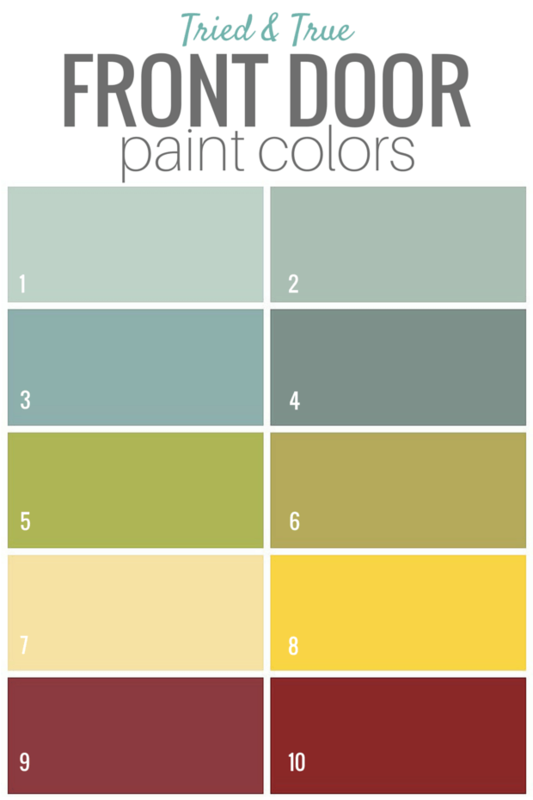 Bring home several paint swatches in varying chartreuse tones and check them out when it’s overcast and sunny by taping them to the door. Be sure to look from a distance as well. Paint colors change drastically depending on the light, so select the one you like the most on both dreary and sunny days. Good luck! I too want to paint my front door another color than the Red we have now and want something different than every house around. My house is part red brick, mostly white siding and black shutters. I have been planning a yellow color door, what does everyone suggest? I look around and every house has the same black, red and white. A royal blue or Navy would be a beautiful color to compliment the traditional setup that you have. Our house is a moss green, I would love a red door, I like the color of the red one on this page do you know that color? Any other suggestions of red would be appreciated. Hi Susi, Have you looked at Benjamin Moore’s Red 2000-10? Glad to see BM Caliente on your list which we found in an old Pottery Barn color palate. 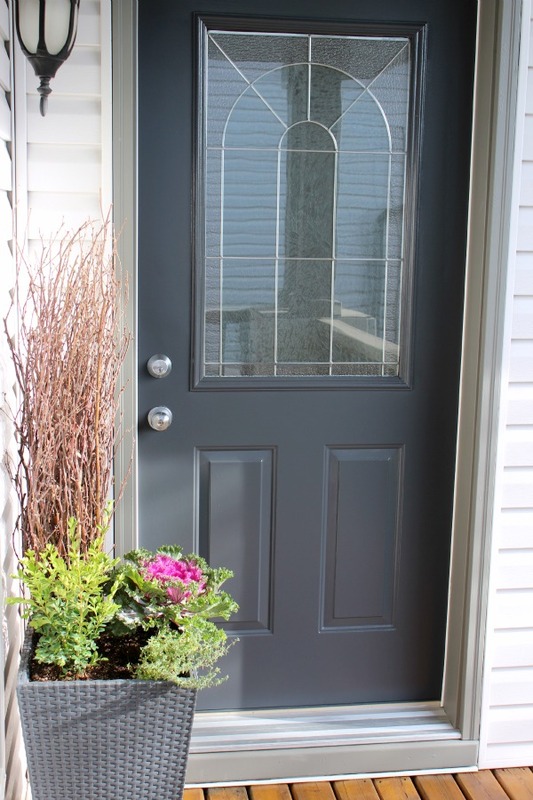 We used soft gloss finish to paint our front door this color; with our gray siding, it’s a great combination! If you are considering Caliente, give it a try and be sure to allow a good 4-6 coats for a deep coverage. We love it and get lots of compliments. Hi Debbie, What about a deep blue color (not quite navy)? Blue pairs nicely with red brick, as well as gray and brown. Hi Patricia, Can you tell me if the grey has more of a blue (cold) undertone or a warmer (brown) undertone? Okay, good to know. What’s the color of the shingles? I am not really sure what colour the shingles are, I am almost positive they are black if not grey, I can’t check this out as I am not in the area and won’t be for a while. I am just anxious to have a picture of what it will look like when I get back there and start painting. 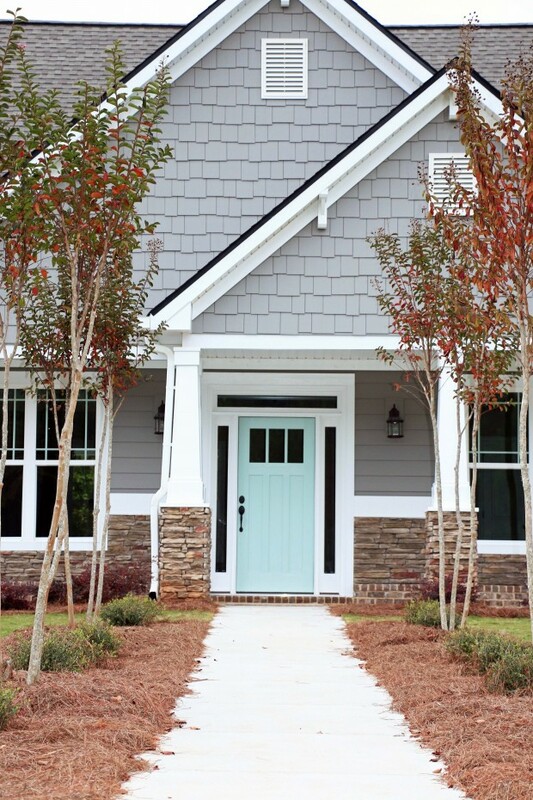 Hi Shauna, Could you tell me the house color, door and trim on the photo of the home with the red brick porch, yellow door and a greenish, blueish, gray house paint? I love it!! I’m looking for your advice. I have a white house and black shutters. The interior of my home is very calming (to me) with light paint colors and muted color furnishings/beach type decor. I’d like that same feeling when pulling into my driveway as I do after I open my now “unpainted” front door. How do you feel about the BM color SOLITUDE for a front door? Hi Leanne, Sounds like a pretty home! Solitude is a beautiful blue-grey that would likely work well. Test it in different lighting along with similar shades and select the best one. I suggest taping larger swatches to the door and standing back to take a look. I am a professional painter and I was looking for a stunning door paint scheme for one of my client. This post helped me find one. Thanks.